The Village within the Village on the sands of Negril. Welcome to the Point Village Suite Resort in lovely Negril Jamaica. Are you prepared to trade your world of classes and schedules for this quiet paradise of lush tropical forests, bird sanctuaries, long white sand beaches and the warm Caribbean sea? Situated on 14 acres this resort gently slopes toward the sea complementing the most breathtaking countryside in the Caribbean. Our spacious villa suite is where the golden sunsets will free your - body, mind and soul. Located at the Northern end of Negril's spectacular coastline, Point Village is at the very heart of Jamaica's beauty. You'll know you're a long way from home when brilliant colors-vibrant green, magenta, and endless sea of aqua - are just beyond a louvered door. 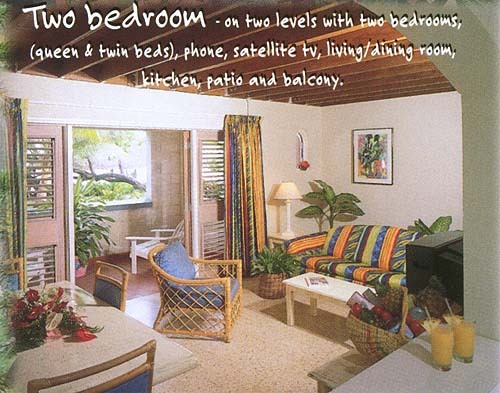 Nowhere else in Negril can you have the best of both retreat and resort vacations. 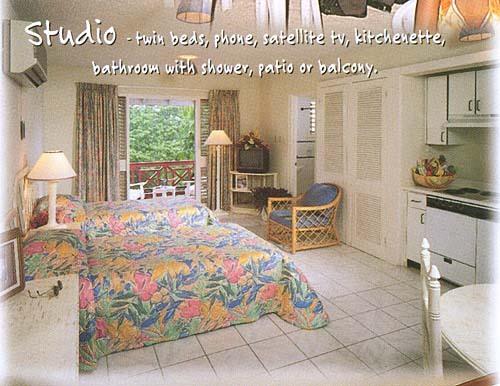 Our fully furnished studio one bedroom and two bedroom villa suite including a fully equipped kitchen and color TV with US satellite reception allows you to retreat in total privacy. In Traditional Village style, a shady pedestrian pathway brings people together and unites this uniquely civilized, jungle paradise. Make your way from breakfast on your private balcony to an hour by yourself on white sand beaches. Explore every water sport or take a day trip to Booby Cay for a lazy afternoon of picnicking, snorkeling and sunning. Sip long, cool tropical drinks by the side of the freshwater pool. Grab a friend for a game of tennis. Dine in or allow our courteous and efficient staff and talented chef to serve you in our fine restaurant. And of course, reserve time to absolutely nothing at all. A snorkeler's paradise as this beautiful property in its diversity features two white sand beaches and spectacular cliffs complete with innumerable grottos. Dine casually in cafes overlooking the sparkling waters of the Caribbean Sea or sample local and international cuisine at the Village Connection restaurant. Local liquors and exciting mixed drinks are served with warm smiles at the three bars. Point Village offers several dining options. Each offers guests a variety of international and local cuisine. The Point Village features two waterside cafes. The Sundrenched Bar and Grill offers lunch and late night snacks grilled to perfection right on the water. 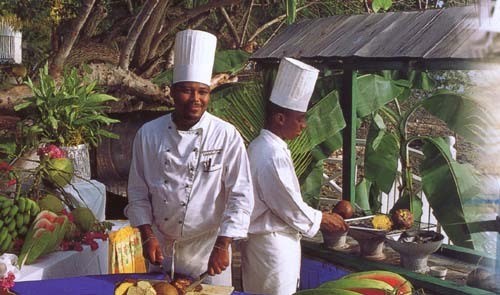 Jamaican cuisine is served for dinner nightly except on Wednesday. Paradise Garden Café-is open in the late afternoon for snacks and for dinner. It serves Pizza & Pasta a la carte. 3 Bars serving an array of delectable beverages ranging from fresh fruit drinks to cocktails featuring domestic liquors. A Parents Dream Come True! 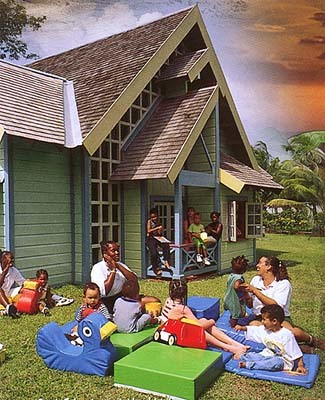 Your children have their own hideaway in our multicolored Children's Playhouse where laughter, activities and adventurous good times with their 'Best Friends" (coordinators) ensure happy memories of newfound friends! Hey Mom and Dad it's only $6.00 per day (includes lunch) with on the hour activities starting from 9am and ending at 6:30pm. 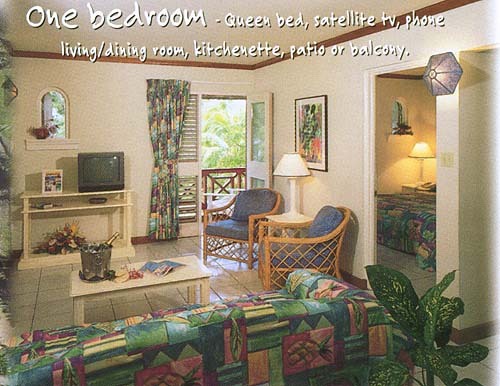 Our fully furnished studio one bedroom and two bedroom villa suite include a fully equipped kitchen, color TV with US satellite allows you to retreat in total privacy.